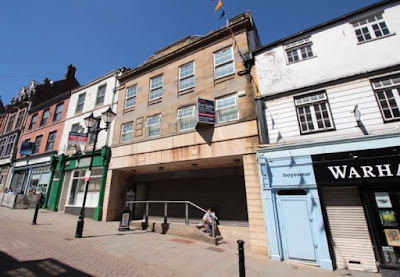 A former department store could be set for a new lease of life under new plans to open a café / bar on Rotherham's historic high street. 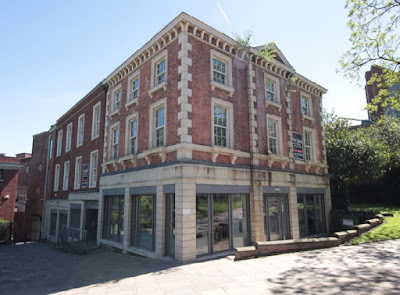 Rothbiz reported in January that a prominent Grade II listed building in Rotherham town centre had gone up for sale, offering a redevelopment opportunity between the award-winning High Street and Rotherham Minster. Now plans have been submitted that would allow part of the former John Speeds department store to be used as a community café / bar. The 11,500 sq ft property is being advertised for sale with real estate firm, GVA and includes 18 High Street and 15 Vicarage Lane. No asking price was provided for the freehold of the property which includes retail space with offices above. It is being promoted as having redevelopment potential. The latest plans are for the 17,000 sq ft ground floor of 18 High Street which has remained vacant since the closure of Phoenix Enterprises. The plans state: "We are proposing a community café / bar use. The café will be open in the day time serving hot and cold light snack/food options to the public, we will provide internet /computer access and offer a range of community groups. We propose to open some evenings as a social space and for events, we propose to serve alcohol of an evening." An outside seating area for the café is also planned. If plans are approved, one full time and five part time jobs could be created. The applicant is Sue Wynne, CEO of Rotherham Rise, the local charity organisation that offers support for victims and survivors of abuse. A number of properties in the area, such as the former Muntus department store on the High Street and the Georgian town house opposite, have been renovated with retail space below new housing. The area was part of the £5m Townscape Heritage Initiative (THI) scheme. The former Speeds Department Store occupied four buildings which were knocked together to form one store but were subsequently divided again to form retail units fronting both Vicarage Lane and High Street. It was redeveloped around ten years ago when plans were approved for the ground floor of the former Rumbelows building to be converted and occupied by Phoenix Enterprises who provided delivery of a variety of programmes and initiatives to help disadvantaged groups back into employment. The ground floor area of the building fronting the All Saints Church, formerly operated by Whitegates and the Factory Shop, was used as a recruitment agency office and also includes a community hall. The first and second floors of the building have been used predominantly for office use. 15 Vicarage Lane is described as a fine, early nineteenth century former townhouse and is Grade II listed. It has pride of place next to the church and the revamped public space. The building is on the site of the old vicarage and excavations in the area revealed medieval deposits.